The Family Computer Disk System (ファミリーコンピュータ ディスクシステム, Famirii Konpyuuta Disuku Shisutemu?) (often shortened to Famicom Disk System (ファミコンディスクシステム, Famikon Disuku Shisutemu?) and abbreviated as FCDS, FDS, or FCD), was released on February 21, 1986 by Nintendo as a peripheral for the Family Computer. It was a unit that used proprietary floppy disks (called "Disk Cards") for data storage. It was announced, but not released, for the North American/PAL region's NES. Through its entire production span, from 1986 to 2003, 4.44 million units were sold. 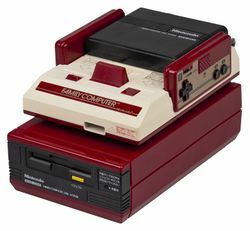 The device was connected to the Famicom deck by plugging a modified cartridge known as the RAM Adapter into the system's cartridge port, which attached via a supplied cable to the disk drive. The RAM adapter contained 32 kilobytes (KB) of RAM for temporary program storage, 8 KB of RAM for tile and sprite data storage, and an ASIC known as the 2C33. The ASIC acted as a disk controller for the floppy drive, and also included additional sound hardware featuring a primitive wavetable synthesizer. The Disk Cards used were double-sided, with a total capacity of 112 KB per disk. Many games spanned both sides of a disk, requiring the user to switch sides at some point during gameplay. A few games used two full disks (four sides). The Disk System was capable of running on six C-cell batteries or the supplied AC adapter. Batteries would usually last five months with daily game play. The battery option was included due to the likelihood of a standard set of AC plugs already being occupied by a Famicom and a television. The Sharp Twin Famicom was a Famicom with a built in FDS. Pages in category "Family Computer Disk System"